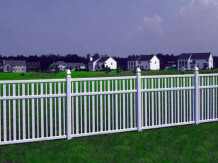 Bufftech Vinyl contemporary fences are easy care with modern-day flair. Styles include the Victorian and Princeton with a 1-1/2″ picket, the Baron with a 3″ picket (offered in smooth as well as Select Cedar wood-grain textures), and the Countess and Monarch which have a combination of 1-1/2″ and 3′ pickets. All the fences in this category (except for the Victorian) are Pool Code compliant and meet most local building codes for use around pools. So no more worrying, you can pick any one of these styles and know you are adhering to Code regulations. 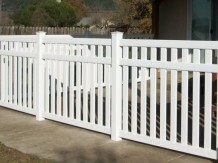 And the vinyl’s long wearing durability of these fences will cause it to stay beautiful for years to come. 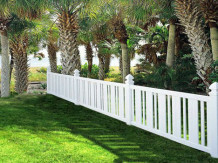 Available in heights: 3′, 4′, 5′, & 6′ tall (the 5′ & 6′ include midrail). 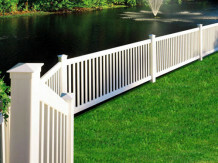 The picket Size is 7/8″ x 1-1/2″, and they are spaced 1-3/4″ apart, so this is pool code compliant. Two available colors: White and Almond. The Baron is unique because it doesn’t just come in the smooth color, it comes in the stained wood-grain textures as well. So you have your choice of 6 different colors: White (smooth), Almond (smooth), Arbor Blend (wood-grain), Arctic Blend (wood-grain), Sierra Blend (wood-grain) and Weathered Blend (wood-grain). Available heights are: 3′, 4′, 5′, & 6′ tall (5′ & 6′ include midrail). 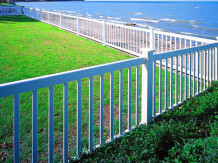 The picket size is 3″x 7/8″ and they are spaced 2-15/16″ (so this style IS pool code compliant). Available heights are 3′, 4′, 5′, & 6′ tall (5′, & 6′ include midrail). With the picket size 7/8″x 1-1/2″AND 7/8″ x 3″, each spaced 3″ apart. Choose from White or Almond in color. The picket size is 7/8″ x 1-1/2″ AND 7/8″ x 3″, with them each spaced 2-5/16″ apart. Your choice on color, White or Almond.